If there’s a commercial establishment in Menlo Park that’s been around longer than Roger Reynolds Nursery & Carriage Stop, it should raise its hands now. Roger Reynolds, who’d been a printer in San Francisco, purchased acreage between El Camino and the then Southern Pacific railroad tracks (now Caltrain) in 1919 and opened his nursery business. 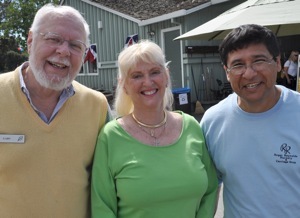 Third-generation owner Sally Halstead – pictured along with managers Gary Entwhistle and Antonio Ramirez – says she still gets inspiration from her grandfather in the redwood grove on the property that was once rented out to groups who wanted a taste of the out-of-doors. Long time Menlo residents will also recall that the current “carriage stop” part of the nursery was once home to Edy’s ice cream. To celebrate its 90th anniversary, the nursery is hosting activities on Saturdays throughout the month of September, which kicked off today with a community appreciation for local businesses and service organizations. Next Saturday (9/12) is vendor appreciation, showcasing locally-produced gardening products, followed by Friends of the Nursery Day on Sept. 19 and a customer appreciation sale on the 26th and 27th. The redwood grove at Roger Reynolds really is great – along with the pond plants and fish! A great spot just to walk around – sort of a mini-arboretum in our backyard!